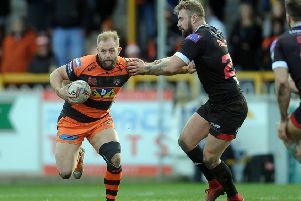 The Pontefract & Castleford Express has teamed up with First Utility, official sponsor of the Super League, to offer five lucky fans the chance to win a pair of tickets to Castleford Tigers’ home game against the Huddersfield Giants on Thursday, May 21. The Tigers will be out for revenge after an unsuccessful trip to the John Smiths Stadium back in round five. Victory here could go a long way towards cementing that all-important top eight finish, but Daryl Powell’s men will have to be on top form to send the Giants home empty-handed – and you could be there to watch all the action LIVE! Who is the current Huddersfield Giants head coach? Throughout the 2015 season, First Utility, the UK’s leading independent energy supplier, will be rewarding Super League fans for their continued support. Fans who switch their gas and electricity to First Utility save on average £229 per year. Visit www.first-utility.com for information. 2. Winners will be selected from complete, eligible and properly submitted entries before the end of the competition period on May 18. 3 .The package does not include travel to or from the ground or any hospitality at the ground.